The McAuliffe GSA in partnership with the Rainbow Peace Flag Project are distributing 3’x5′ flags. All flags are FREE and donations are welcome, as donations help to support the purchasing of more flags. The suggested donation is $5/per flag. 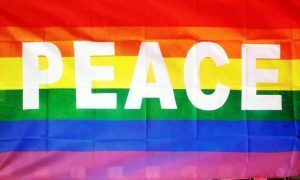 Our goal is to have Rainbow Peace Flags flying at businesses, outside of homes and throughout metrowest to display our message of peace, inclusion, and solidarity. Contact Jennifer Loy, jloy@mcauliffecharter.org, for more information and to reserve a flag today!